The official bird of British Columbia, the Steller’s jay is the darkest jay in North America and the only crested jay found in the west. Beautiful and bold, this is a popular bird in many parks, campgrounds, and backyards. Markings: Genders are similar with a black or gray-black head and crest, sometimes showing narrow white or light blue streaking on the forehead and above the eye. The neck, throat, back and upper chest are black or dark gray and the underparts are a rich blue. The wings and tail are a brighter blue or bluish purple with thin black barring in a ripple pattern. The legs and feet are black, and the eyes are dark. In some subspecies, the crest and back can appear more blue than black or gray. Juveniles look similar to adults but have less defined markings and more gray in their plumage. Steller’s jays can be found at lower mountain elevations throughout western North America, including mountainous regions of Mexico and Central America. The most widespread populations are in the Rocky Mountain region including Colorado, Wyoming, Montana, Utah, Idaho, Washington, Oregon and northern California, as well as British Columbia. These birds prefer mixed pine and oak or pure coniferous forests, but they will also frequent campgrounds, backyards and urban parks in appropriate habitats. Steller’s jays do not migrate to completely separate seasonal ranges but may have some limited altitudinal migration in winter. Steller’s jays are noisy birds with a wide repertoire of sounds. Their song is an uneven buzzy chirping, and calls include a moderately paced “chip-chip-chip-chip-chip” that can sound scolding. Their voice is generally raspier or coarser than more familiar jays. These birds are also excellent mimics and can recreate sounds from other birds and animals including red-tailed hawks, loons, chickens, squirrels, dogs, and cats. Steller’s jays can be bold when they become accustomed to humans and have even been noted to rob campsites of unattended tidbits. Deeper in the forest, however, they can be much more elusive and may skulk through thicker vegetation to avoid being seen, typically stay higher in the canopy. These birds will form family flocks of a dozen birds or more after the nesting season and often travel in groups. When feeding, they frequently cache nuts and seeds for later use. These are monogamous birds believed to mate for life, with a bond cemented through courtship behavior that includes ritual feeding when the male brings tidbits to the female. Both genders work together to build a cup-shaped nest of pine needles, twigs, leaves, roots, and grass, often using mud to hold nesting materials together. The nest is positioned in a tree and may be as high as 100 feet above the ground. A successfully bonded pair will raise one brood of 2-6 eggs annually. The eggs are pale green or blue with brown flecks. The female parent incubates the eggs for 16-18 days, and both parents will feed the altricial young for 18-20 days until they are ready to leave the nest. 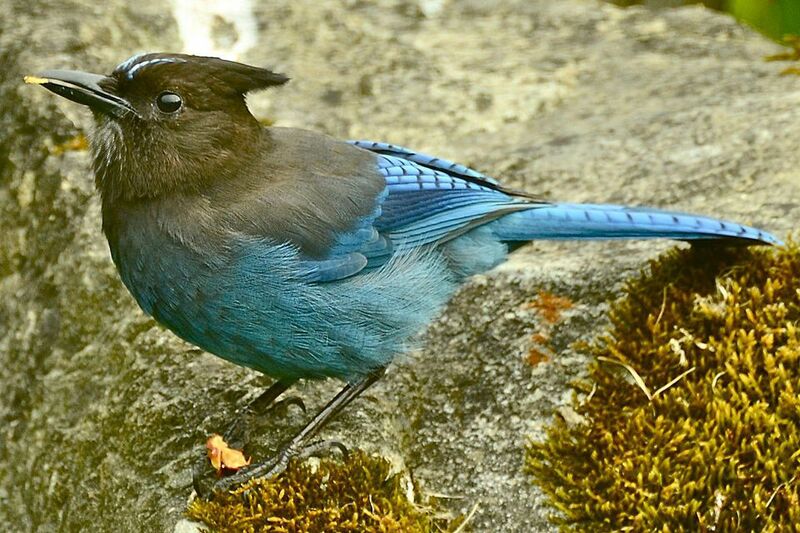 On rare occasions, Steller's jays will hybridize with blue jays where their ranges overlap. These birds will regularly visit backyard feeders where peanuts, black oil sunflower seeds, suet, and fruit are available. Backyard birders who offer these foods in several widely spaced feeders can accommodate the medium-sized family flocks that Steller’s jays travel in, and having pine trees nearby will give the birds a sheltered space for roosting or nesting. Planting oak trees and berry bushes can also provide natural foods to tempt these jays to visit. While these jays are not considered threatened or endangered, their populations can be affected by habitat loss, particularly in areas of their range where logging is a thriving industry.